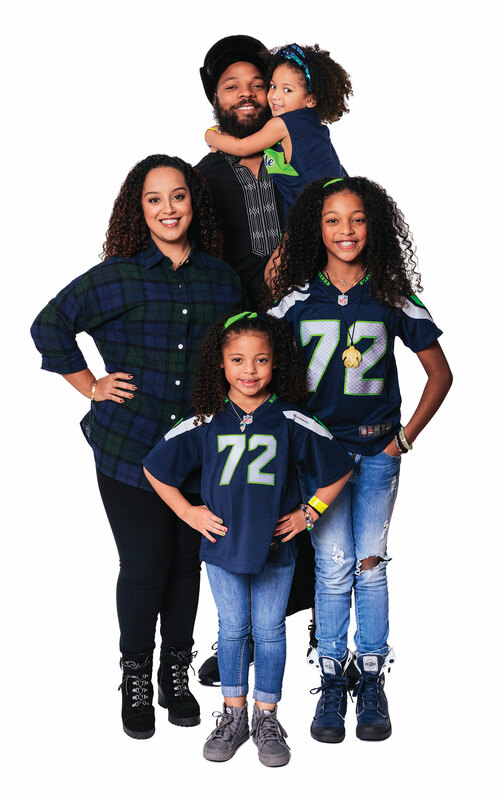 The first image you see on The Bennett Foundation website is of Michael Bennett — the 6-foot-4, 274-pound Seattle Seahawk with a fierce reputation as a pass rusher — on an itty-bitty yellow bicycle. It brings to mind another memorable bike ride: that time Michael took a police two-wheeler for a joyride around CenturyLink Field after the Hawks’ had-to-see-it-to-believe-it win over the Green Bay Packers in 2015. This athlete, you realize, knows how to have a good time. This shouldn’t be a surprise. Michael and his wife Pele, who’ve been together since they were teenagers, have three young daughters: Peyton, Blake and Ollie (who are 10, 6 and 3). Together, the quintet support The Bennett Foundation (see their silhouettes running in the logo, Ollie, the youngest, still in pigtails). For those who only know of Michael’s work on the field, the family foundation — and his dedication to its mission of raising awareness and education about childhood obesity — might be news. The Bennetts started the foundation after Michael took a trip to Hawaii in spring 2014; there, he participated in a roundtable conference at the state capitol about obesity. Inspired to move more quickly than government is sometimes wont to do, Michael and Pele got to work on educating communities about childhood obesity. That June, mere months after his trip, the Bennetts hosted the first OCEAN Health Fest. 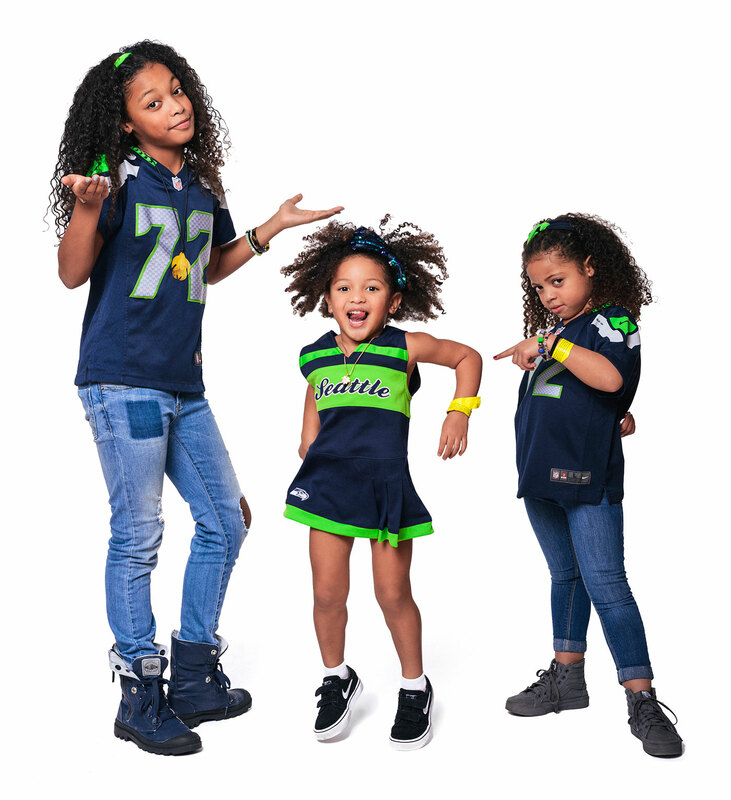 More than 1,000 people attended the five-day event, which featured healthy cooking demonstrations, free health screenings and, of course, a Michael Bennett football camp. Clearly a hit, The Bennett Foundation has partnered with the likes of Safeway, Delta Air Lines and locally with Seattle Tilth, and plans to expand its programs. In November, for example, Michael stopped by Rainier Beach High School for a stint in the cooking club led by Seattle Tilth (see a snapshot of that trip plus other foundation photos on Instagram). Read more from our January 2017 print issue. Despite their young ages, the girls, it seems, are already taking note. The two older Bennett sisters, whom Pele says are “bookworms,” recently started their own book club. Inspired by their dad’s similar venture with the Seahawks, Peyton and Blake share their favorite stories over Instagram as the Pencils on Paper Club. Eventually, says Pele, they hope to move the club beyond Instagram and start doing book drives, among other literary outreach. The family is also working on a children’s book that’ll publish in early 2017; it’ll follow the Bennetts in a typical day in the life of the famous family. The point, says Michael, is to show that no matter your day job, the ups and downs of parenting are universal. Learn more about the Bennett family’s work via Facebook, Twitter, Instagram and on their website.